Hannah Arendt’s story surrounding the writing of The Banality of Evil is a shocking one, not so much for her adept philosophical statements, which are still apt (see Errol Morris’ documentary Dr. Death for just one of many examples of a reinforcement of her New Yorker essay) but rather for her astounding courage, or is it an artlessness born of academic hubris (?) to not only provide a well researched counterarguments to the motivations of hundreds of German Nazi followers who committed terrible crimes during the Holocaust, but to do so during the trial of Eichmann, a major feather in the cap of a Mossad and Shin Bet collaboration, and a time when emotions, not only in the Jewish community, but all over the world were at their peak. Margaretha von Trotta concerns herself with female issues in the same way Martin Scorsese concerns himself with men’s issues, therefore on the surface it would appear she is the right person to tackle the life of Hannah Arendt, condensed into the four-year period when she wrote and managed the consequences of her New Yorker essay, which led to the book, ‘Eichmann in Jerusalem: A report on The Banality of Evil’. von Trotta is no stranger to this process of coagulation of subject matter on behalf of portraying women lives through a certain key event, that might not significantly sum up the life but through which the person in their entirety can be revealed. Therefore, her choice of the Eichmann report comes through strongly, significantly revealing the relationship and academic losses Arendt experienced because she was a thinking female who spoke her mind. Her past comes up in the film to haunt her, the relationship with Heidegger, the Germanic-Jewish heritage, rather than being points of reference, von Trotta uses them to display the character of Arendt and, most interestingly of all, her repeated shock at the emotionally unbalanced responses of her detractors and the seriousness with which their groundless criticisms are treated. However von Trotta, who writes (along side Pam Katz) as well as directs, traverses this terrain, not as the reactionary, but rather with an overall interest in “showing how women think” and subsequently, how powerful women interact with the world. While Arendt’s detractors are essential to her internal conflict the cameras gaze remains firmly on Arendt, and in fact reduces (deliberately) her detractors to symbols of conflict that have very little to do with Arendt being female. Exceptional editing reveal controversial issues in Arendt’s life, such as her love affair with Martin Heidegger, as unsentimental building blocks in Arendt’s thinking process, rather than as any sort of influence over the content of her subject. The remarkable result is a pragmatic encapsulating of the way this very great thinker constructs her ideas as a fully functioning intellectual, respectfully revealing her life’s experiences as on going self examinations rather than petty influences on whatever her latest discourse. Through Barbra Sukowa (an actor who frequently works with von Trotta) and the long time collaborative relationship between the two, von Trotta is able to see her vision realized properly. 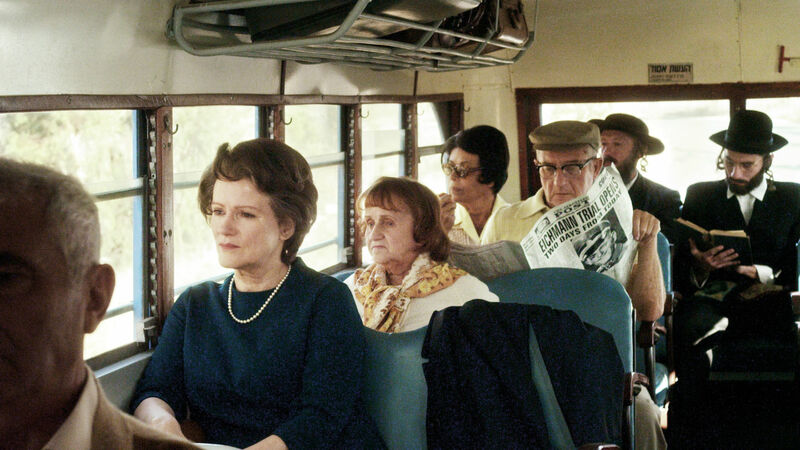 The camera rests always on Arendt – she is the subject, she is the narrative, and yet von Trotta is able to avoid all the trappings of the ‘bio-pic’ by focusing on thought processes as opposed to the essentialist female body. The audience move inside Arendt and observe the swirl of events unapologetically from her perspective, after all the film is titled Hannah Arendt, not The Banality of Evil, or the Eichmann trials reporter, or Heidegger’s lover. Events from her past are the stuff of contemplative memory, unaffected swirls that take their meaning from the context in which they are remembered, rather than an omnipotent observer. Striking also is Sukowa’s portrayal of a woman affected, but unshaken by the manipulations of those around her, always willing to be convinced by a superior argument, but equally unwilling to be motivated by groundless pressures. Hannah Arendt, as portrayed by von Trotta and Sukowa, doesn’t budge from her position primarily because none of the opposition make any sense to her. The opening scenes set the tone for the film, and are beautifully wrought. A man gets off a bus in the middle of ‘nowhere’, walks down the road by flashlight and is suddenly beset upon by two men dressed in black with face masks on. He is tossed into the back of the truck as he screams. 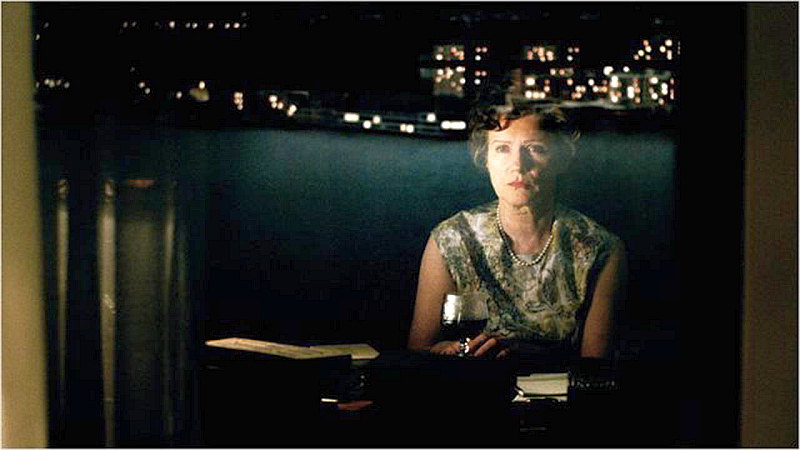 The camera then moves to the image of Sukowa as Arendt emerging from the dusky darkness of her room. She holds a cigarette and stares into the camera, and then passed it, as she smokes and wanders her apartment alone at night. She is deep in thought, not an unconscious escapist meandering, but a concentrated beam of focus, piercing a foggy darkness that engulfs her. She moves to her couch and the camera follows her, she lays down gracefully and smokes, staring at the ceiling, allowing her body to go through a process of shock that we assume is her version of the shared experience of many when the news of Eichmann’s capture first broke headlines. She lays still and she thinks. She closes her eyes and she thinks. She takes a drag on cigarette and she thinks. There is a dark, ominous music playing in the background as if this very act of contemplation, is an act of subversion. This opening scene of watching Hannah Arendt think, is almost a full two minutes long, is done in one take and sets the tone for the subject matter of the film – not Eichmann, but Arendt and how she thinks. 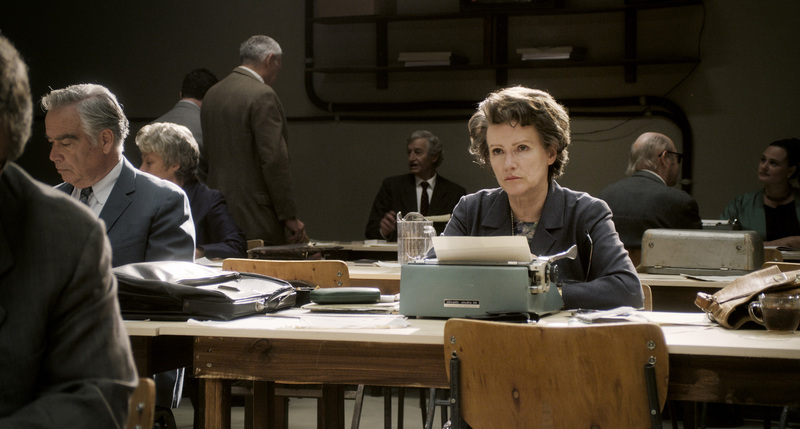 If the film Hannah Arendt has flaws it is in the dialogue, as it is forced, clunky and immature at times evoking a weakness of context that detracts from the free flow of the overarching narrative, but there is so much to appreciate in Hannah Arendt that these oddities becomes slight imperfections. von Trotta, being the masterfully skilled film maker that she is, knew precisely what she wanted to do, and has great command of the film, surrounding her in a hard fought for team who understand how to fulfil her vision. If you are new to the events that led to Arendt’s book, ‘The Banality of Evil’, the film will excite a great deal of thought and vivid conversation and if you are familiar with Arendt’s work there is much to enjoy in the films representations. So looking forward to this film! Love Hannah Arendt! Me too! I think you’ll really enjoy it. I liked this film enough to want to see it several times.